The truth is that I didn’t actually pay the $500 out of my own pocket. I book all my hotel reservations on Hotels.com, and for every booking you earn reward points which can be used to earn free nights at any hotel in the world. I had a lot of points built up, and a few months ago I decided that I needed to start using them before they change the rules or something and I can’t use what I’ve earned. 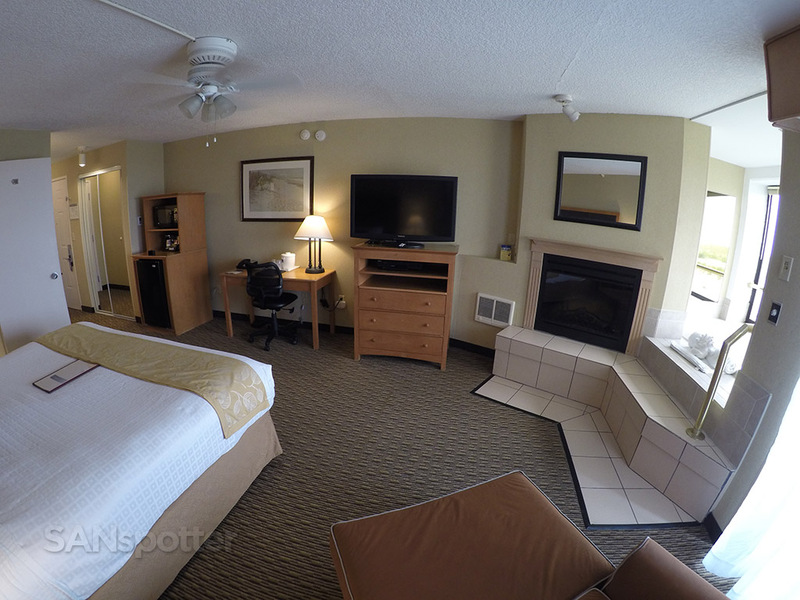 So – being that I wanted to spend the night in Seaside, and pretty much EVERYTHING was booked solid for that weekend, a $500 room at the Best Western was the only option. Sounds like a fine use of reward points, doesn’t it? I was a bit reluctant to think so, but I went for it anyway. 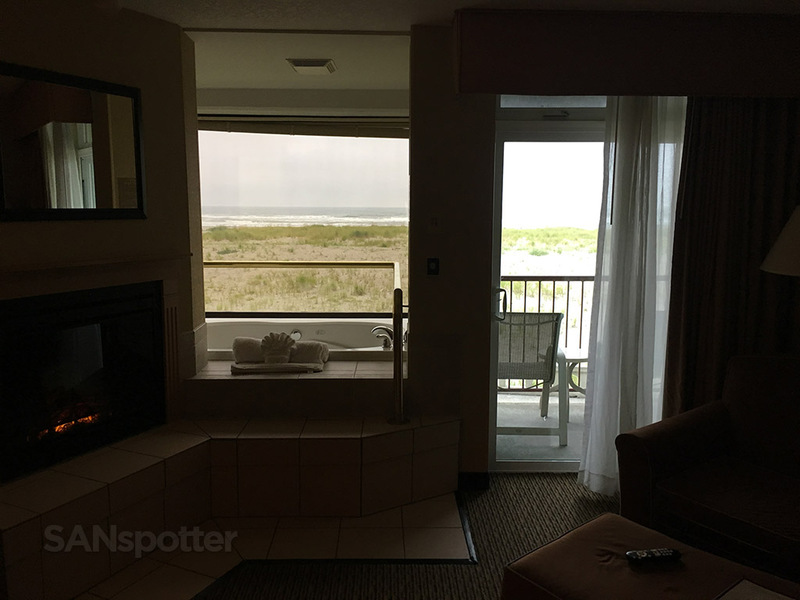 I set my expectations rather low even though I had booked a room with an ocean view. This was a Best Western after all, and I don’t know of anyone who associates this brand with luxury 5-star accommodations. I sure don’t, and that’s what I kept in mind as I pulled up to this hotel in my rental car. 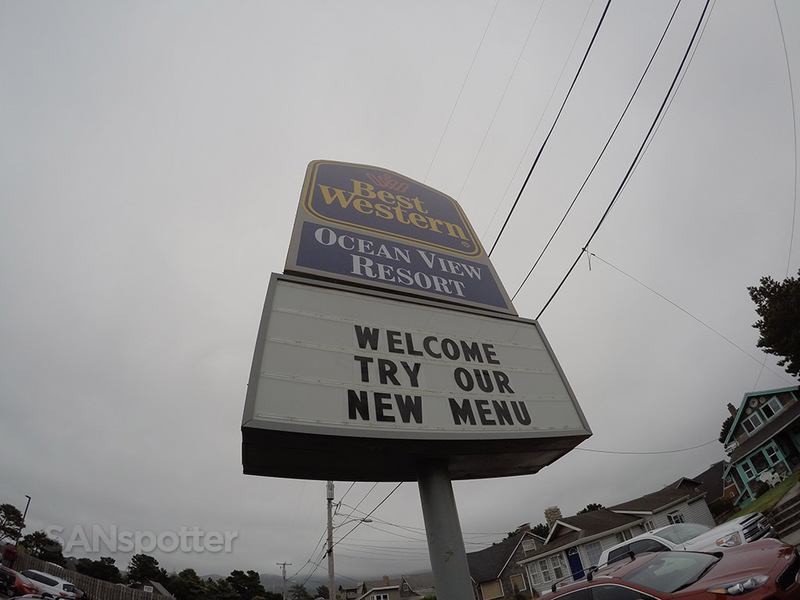 To be honest, the exterior of the Best Western Ocean View Resort doesn’t look that flattering. The gloomy gray skies didn’t help to make this place look very enticing. 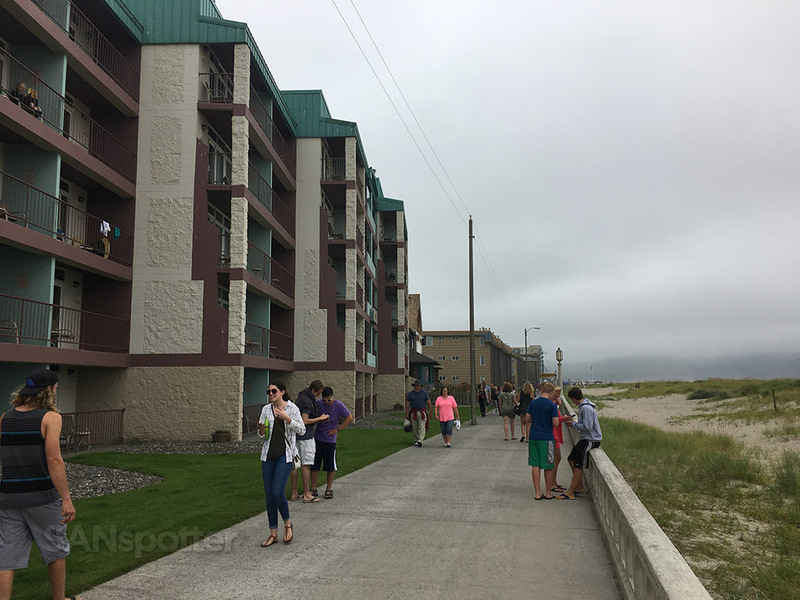 This property is right on the beach, however, and it looks much more like a decent hotel from the back. 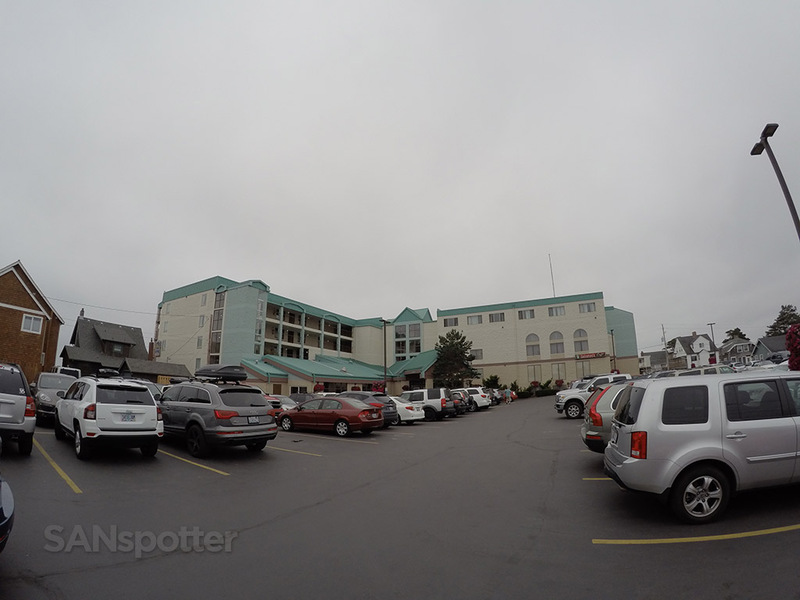 It’s location right on the boardwalk was nice. 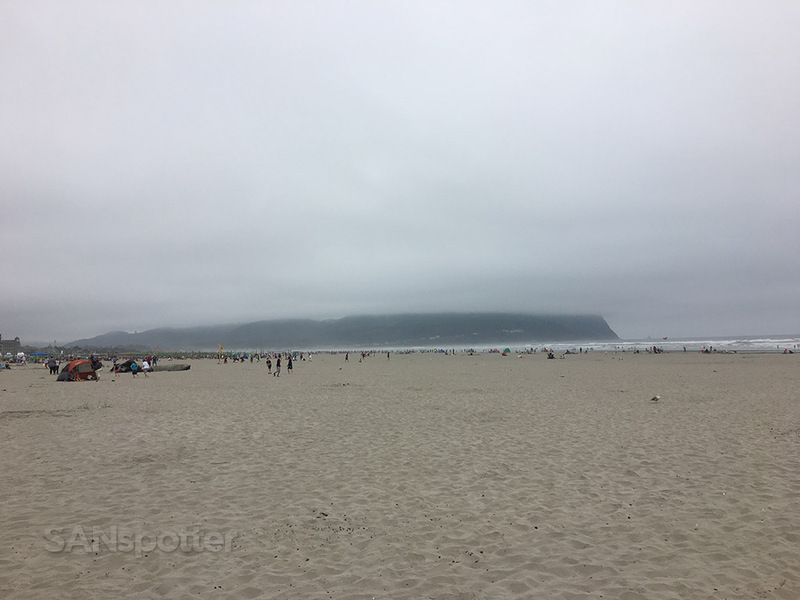 Too bad it was so cloudy and cold during my stay! My first impressions of this place were mixed. On one hand, it looked a bit dumpy on the outside. 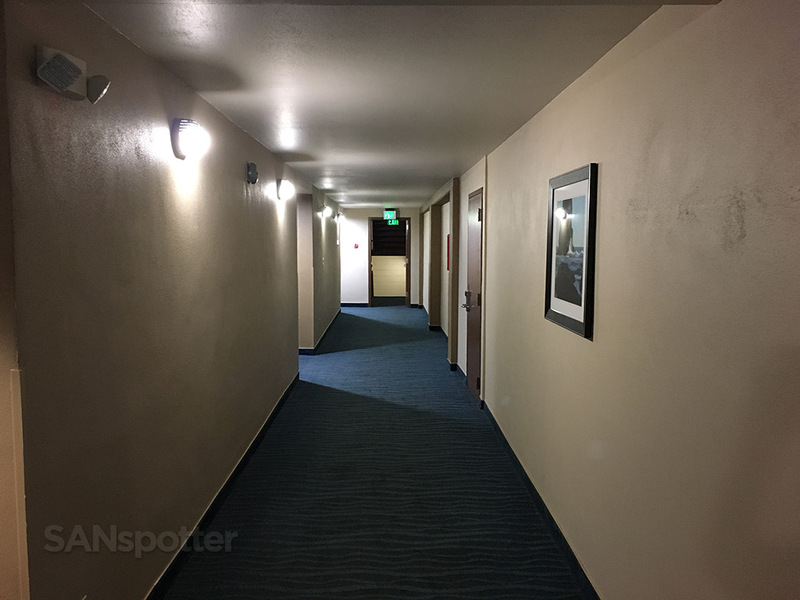 Not unsafe or decrepit or anything, but…well…pretty much like a low-end budget hotel that hadn’t been updated in 20 years. On the other hand, the location was phenomenal! 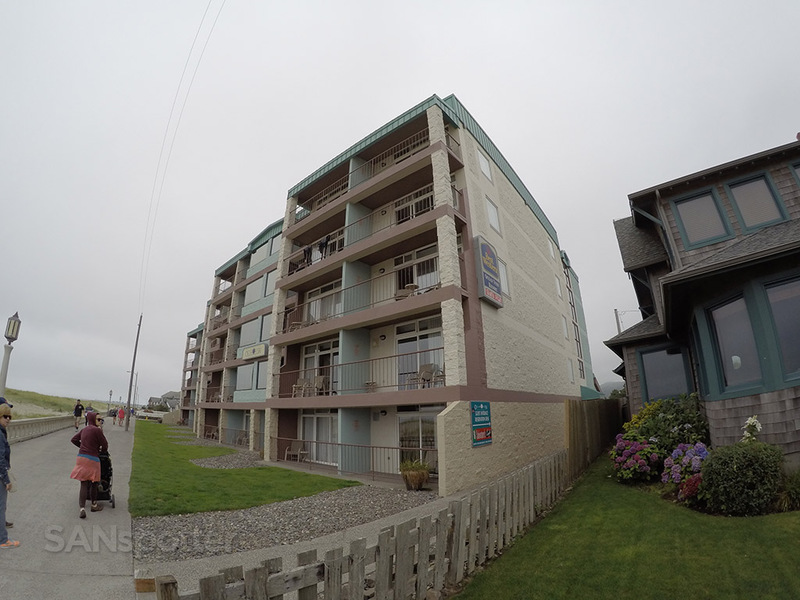 It’s located right on the beach, just a few minutes walk to the downtown area of Seaside. 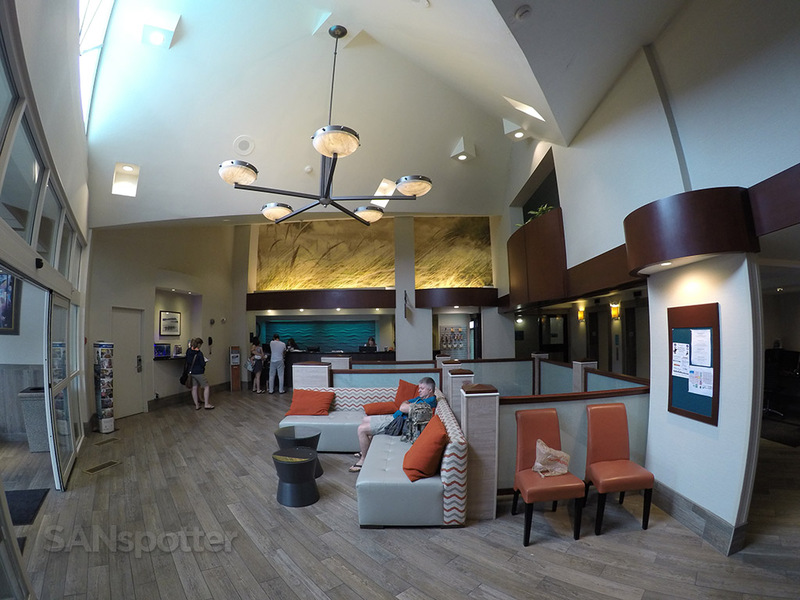 Main lobby – looks really nice compared to the bland exterior of this hotel. Guest room hallways – some were exposed to the outdoors, and others were completely enclosed like this one. 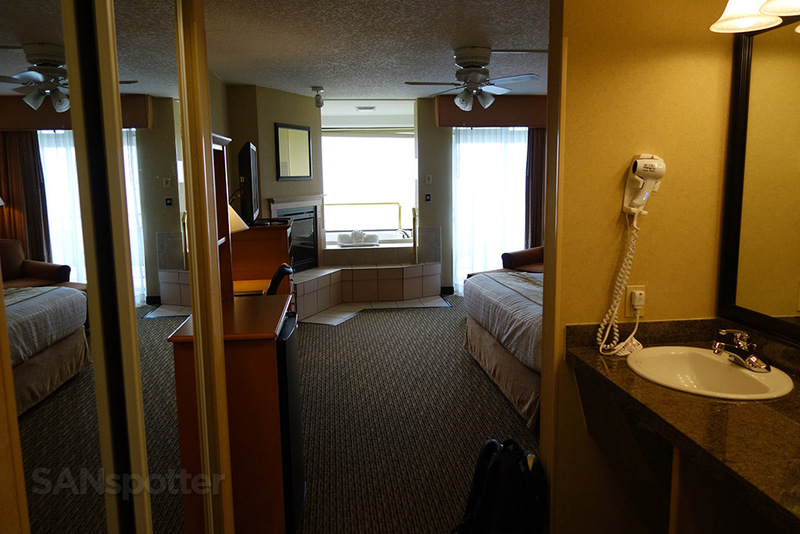 The lobby and guest room hallways were pretty much standard Best Western (complete with the loud buzzing from vending and ice machines), but I opened the door to my room and…wow!! 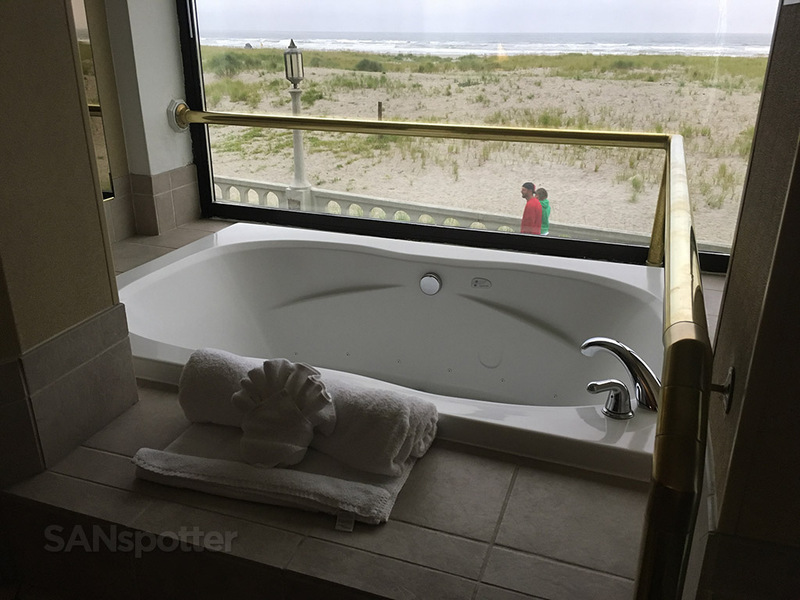 The first thing I noticed was the huge jacuzzi with an amazing view of the ocean, and the other thing was…that view of the ocean! 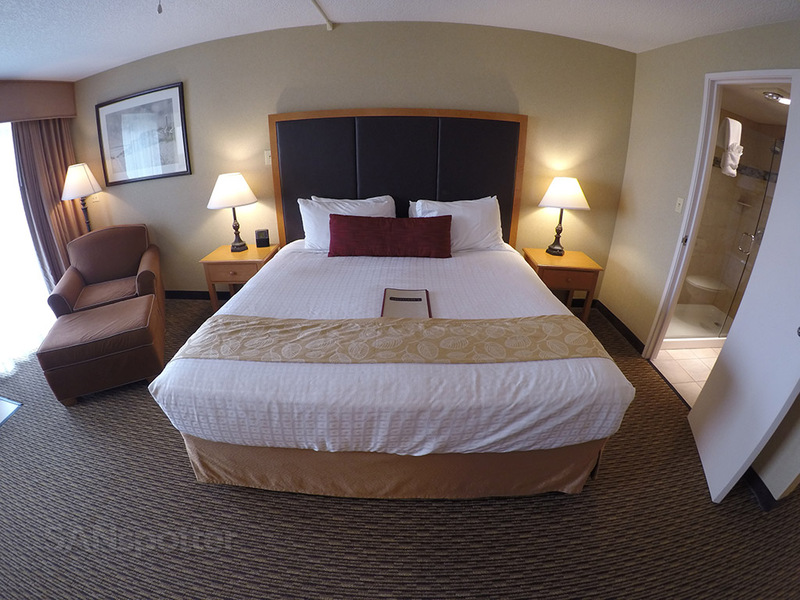 It was at that instant that I didn’t feel so bad for spending $500 in rewards points to stay in this room. This was nice! 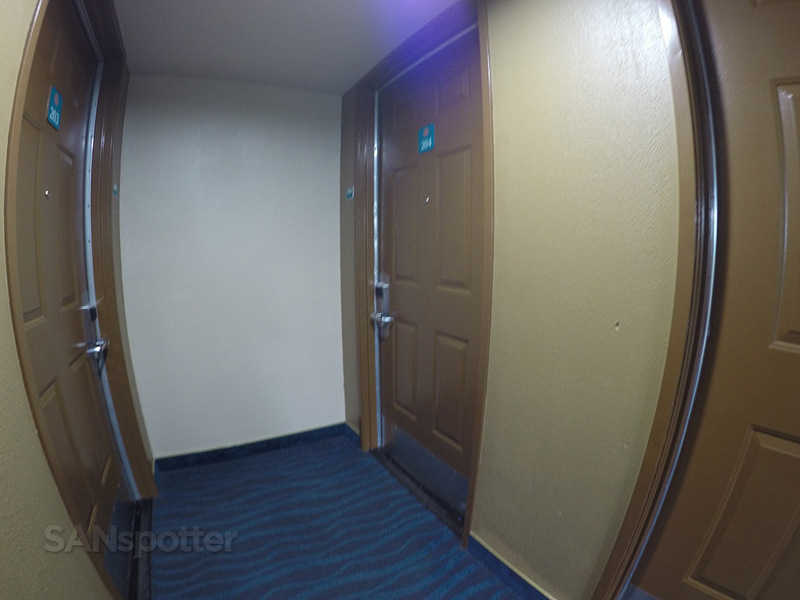 The door to my room (204) was located in a tight corridor adjacent to 3 others. My first view of the room just after opening the door. Are you kidding me?? 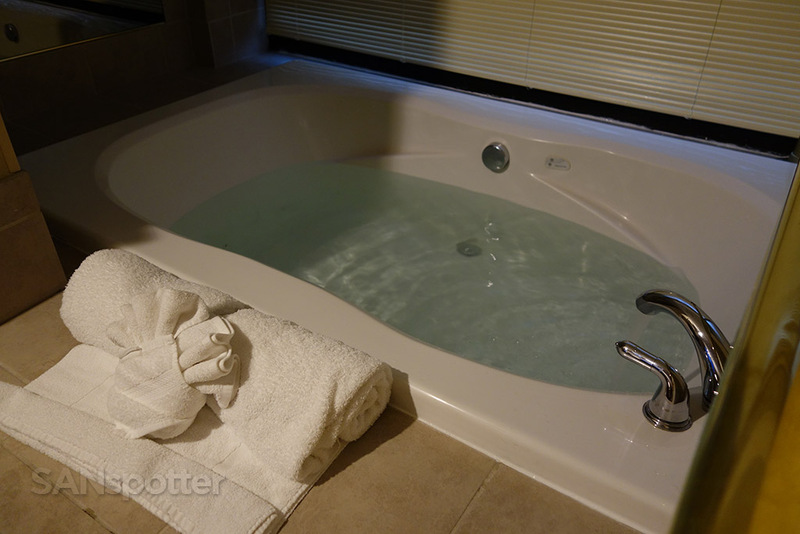 This jacuzzi was a nice (and very unexpected) surprise! Oh yeah – this thing is gonna get some use later! There was also a private patio with an awesome view. Too bad the weather was so dull! Here’s a better shot showing how good the view is from this room. The room itself wasn’t anything special. Clean and comfortable, as expected. 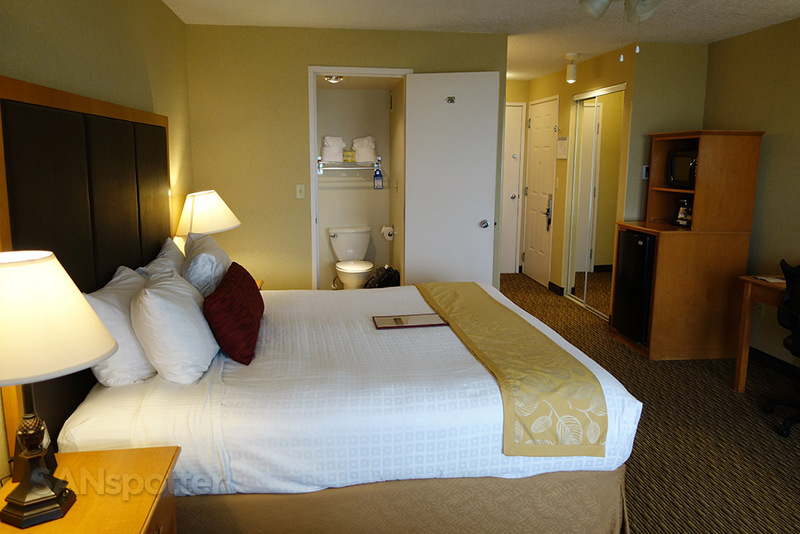 I found the decor to be somewhat dated, but then again this is just a Best Western. I guess I can’t complain too much. 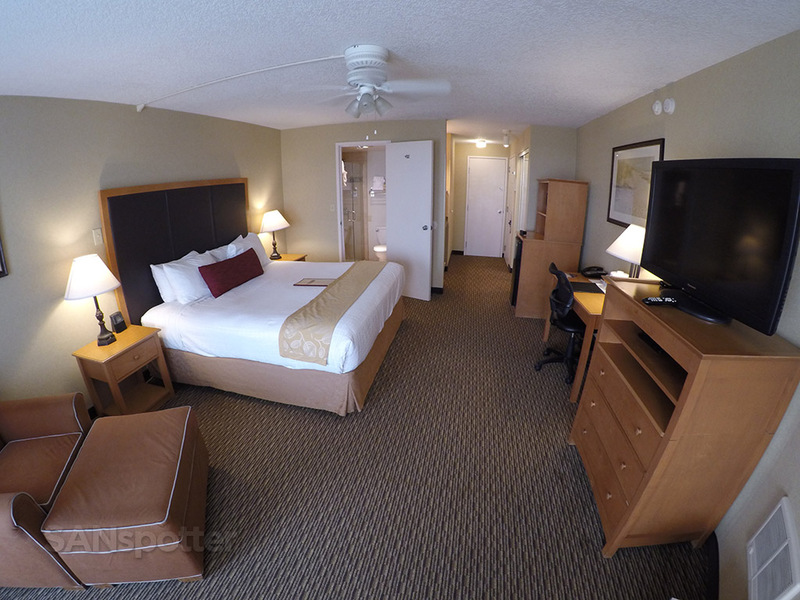 Here’s a wide angle view of the entire room. Another wide angle view, looking the other way. 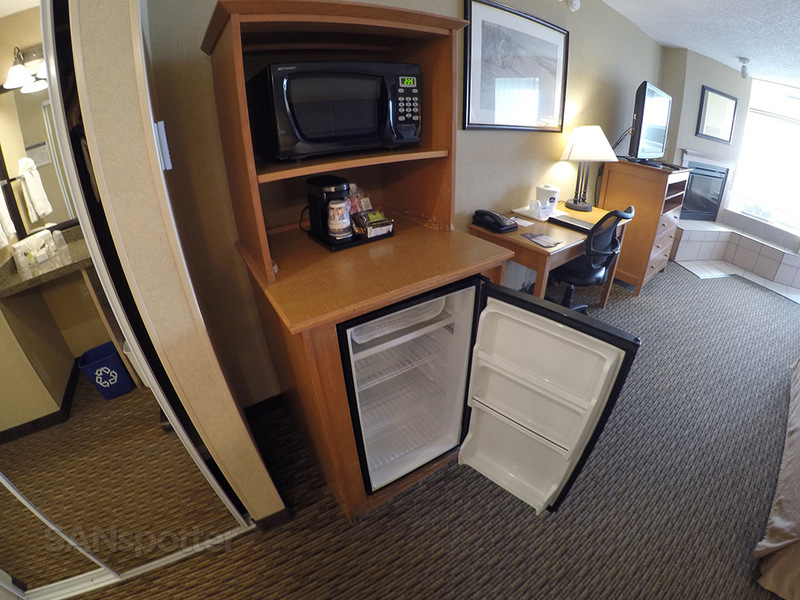 This room also had a microwave and decently sized refrigerator. I definitely would have used these if I was staying for more than one night. 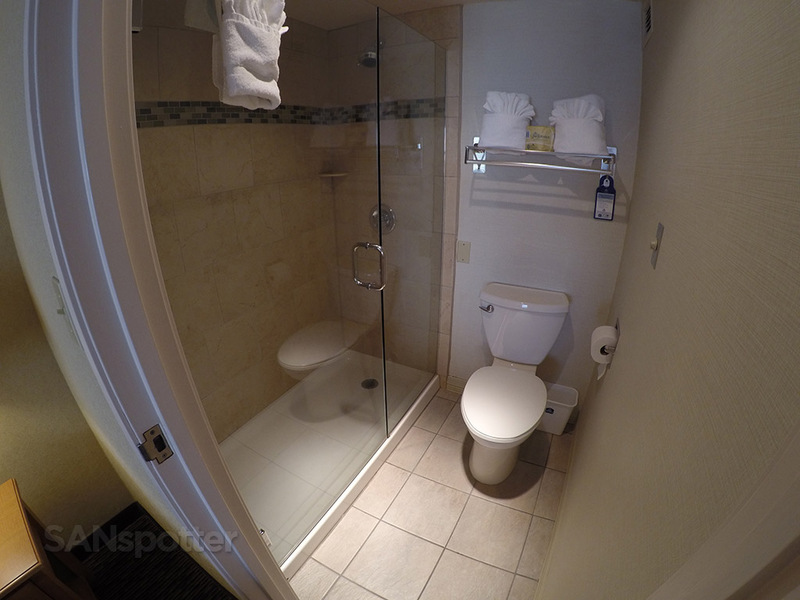 The toilet and shower were separated from the vanity. 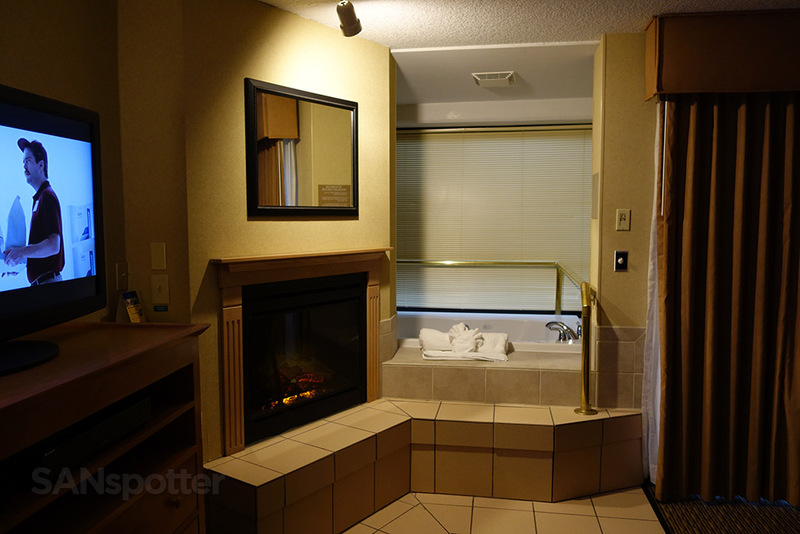 Another nice touch that I really liked was the faux fireplace right next to the jacuzzi. I found it to be a really nice small detail that really made me feel at home and relaxed during my stay. The faux fireplace next to the jacuzzi was a nice touch. 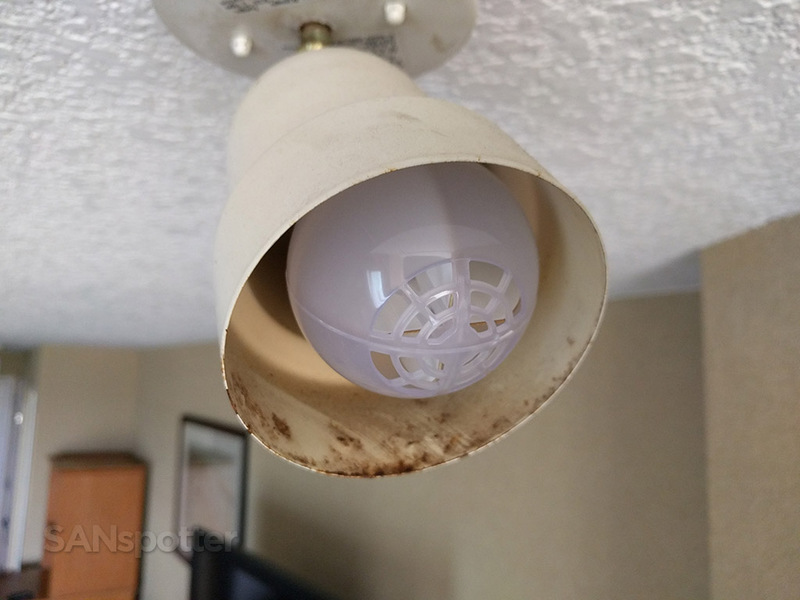 The only real negative thing I could say about this room was that every now and then I discovered something really nasty like this rusted and burned ceiling light shroud. 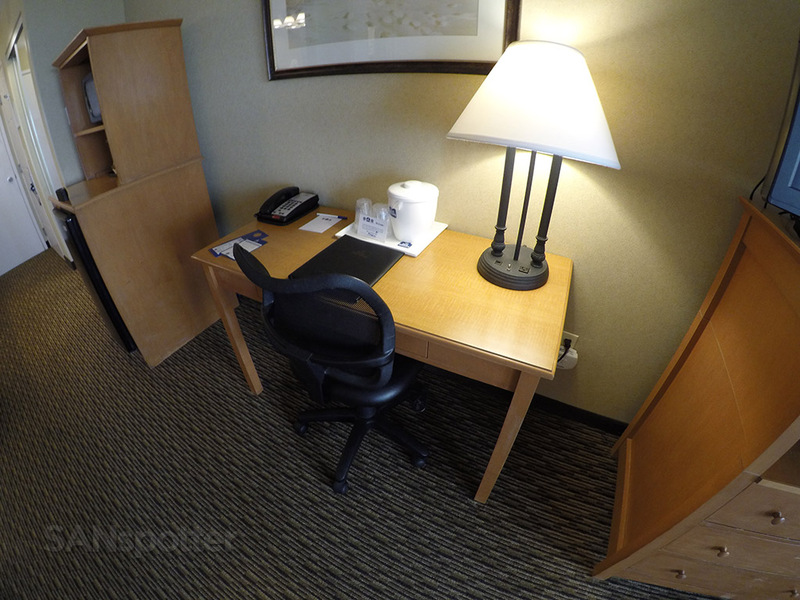 It was a clear reminder that this was still a budget hotel. Having access to this just a few steps outside the hotel door was very nice. 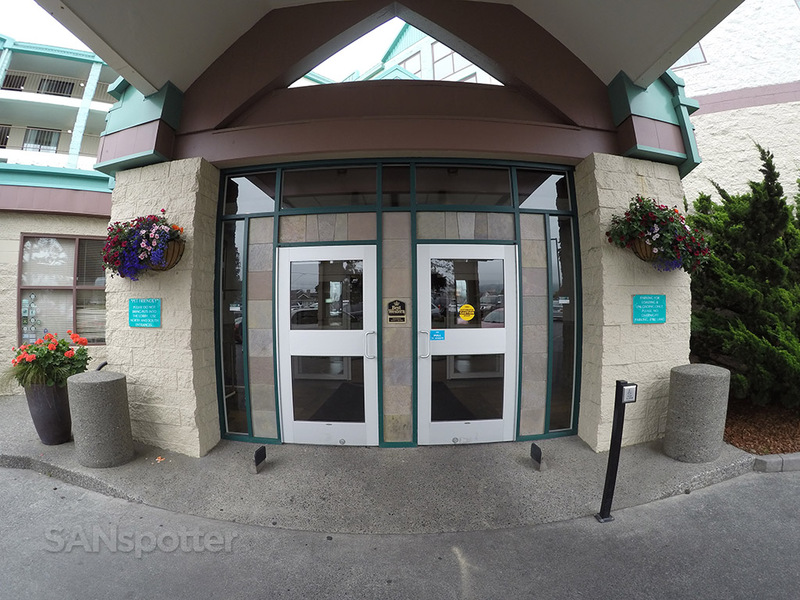 It only took 3 minutes to walk to the heart of Seaside. 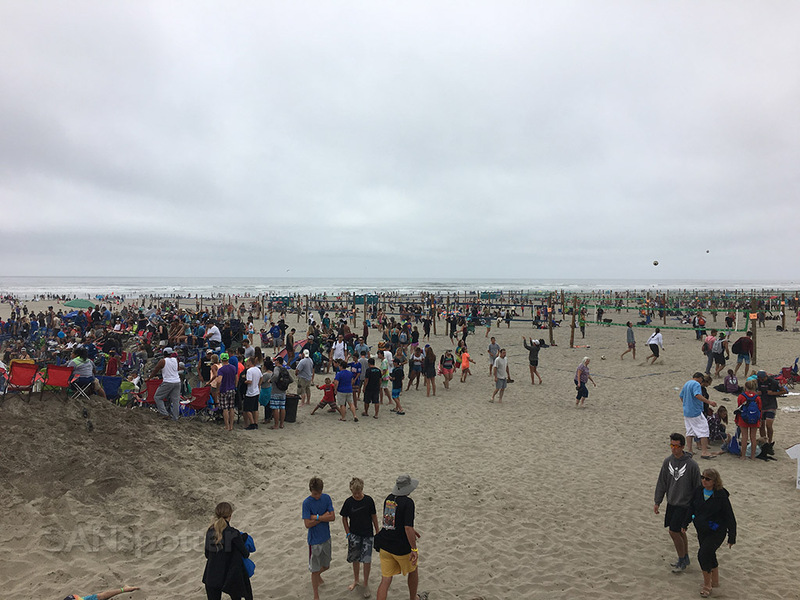 No wonder all hotels in Seaside were sold out tonight – look at all these people on the beach! The attached restaurant (Salvatore’s Café) offered room service, which was really nice to see. I’m a sucker for hotel room service, so that was a nice score. And you know what? The food was pretty good! I had both dinner and breakfast delivered to my room and I found both meals more than acceptable. 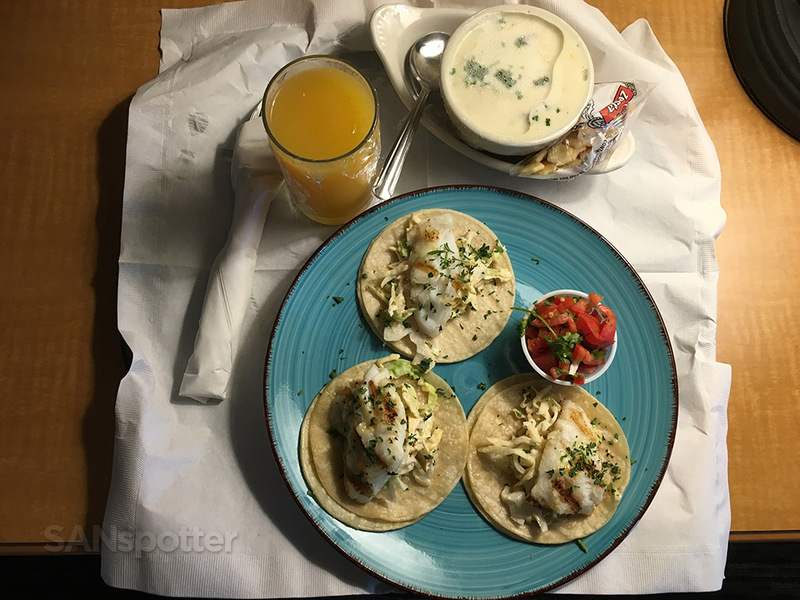 Room service dinner: fish tacos, a cup of clam chowder, and a glass of orange juice. 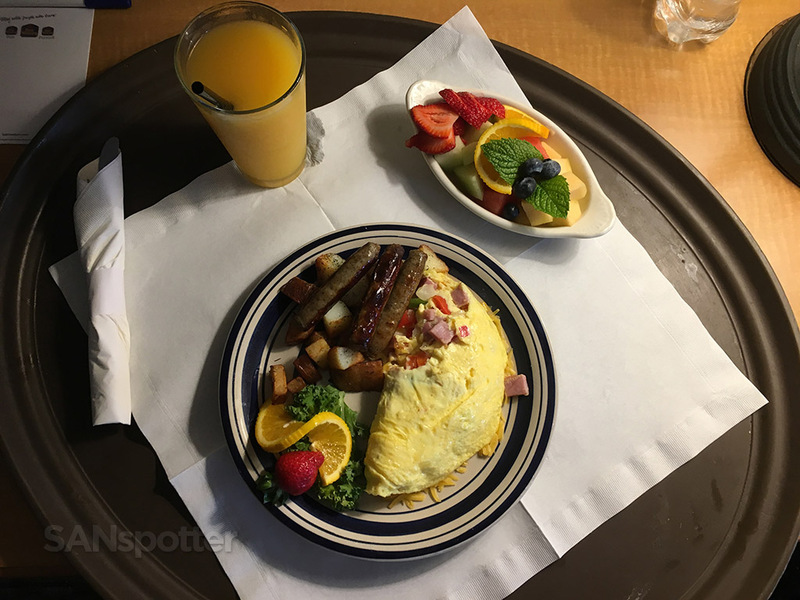 Room service breakfast: ham and cheese omelet, sausage, potatoes, and a side of fruit (plus orange juice, of course). Very tasty! 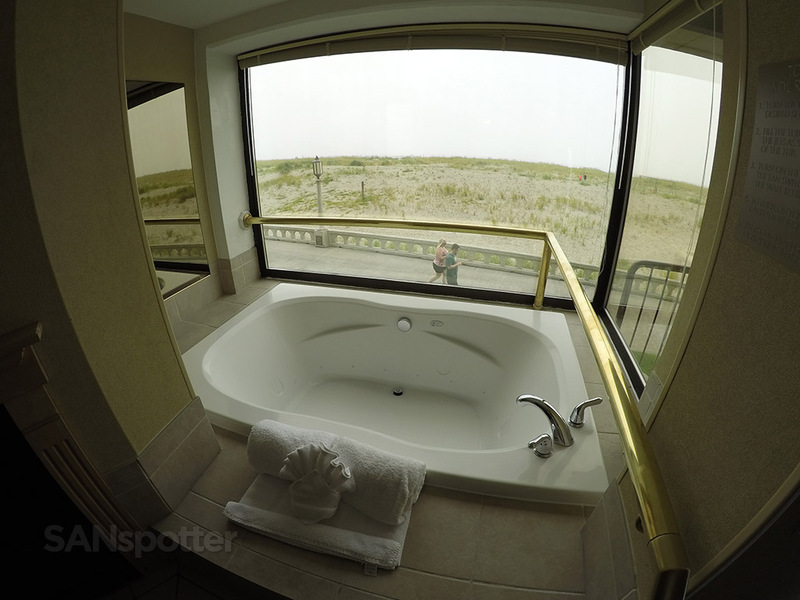 In conclusion, the in-room jacuzzi and amazing ocean views helped to convince me that yes, I would stay here again. Would I pay $500 out of my own pocket for it though? Not a chance. It’s a good property in a very nice area but it’s not $500/night good. Especially if I couldn’t get a room with a view. Ouch – yeah, I way overpaid. Haha! 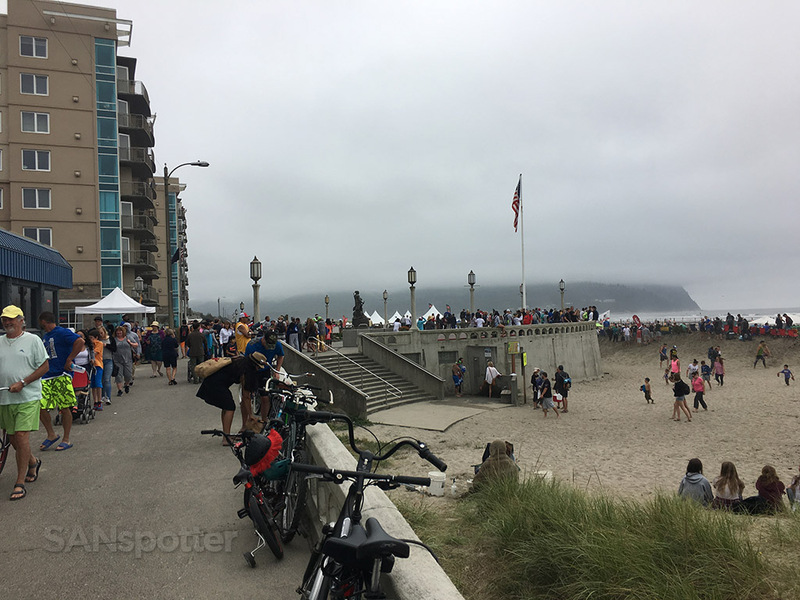 Part of the reason why it was so expensive was that there was some sort of beach volleyball tournament happening at the time and nearly every hotel in the area was sold out. This property definitely isn’t worth $500/night, but I’d be thrilled to pay $130. You got a really good deal!